I just wanted to post some updates on Grayson. He is such a fun little guy, and is growing up so fast! - Gray is very smart. He can spell his first and last name. He can even spell his first name backwards. He knows his phone number. He can count to 50 (with a few reminders -- sometimes he still says "28, 29, 20-10!" for 30). He can spell/read 'dog', 'cat', 'lion', 'mom', 'dad', 'hug', and a few more. - He has an incredible memory. He came home from preschool one day and recited "Brown Bear, Brown Bear, What do you see?" to me from memory. Just from hearing it once at school. He also knows nearly every movie he's seen by heart, I swear. It's crazy. - Gray is still a very picky eater, and it frustrates me to no end. 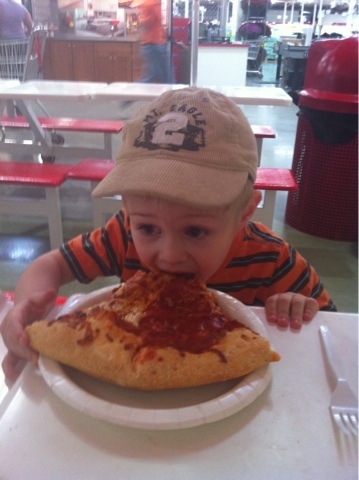 :P Pretty much the only thing he's guaranteed to eat is pizza. - Gray us a very good big brother, and loves to make Thatcher laugh. He gets him his binky when he cries, or tickles him until he's happy again. - He loves to help, and has a few chores he does himself. He's in charge of feeding the dog, putting the dishes in the dishwasher, and cleaning up his toys/books. - Gray wants to be just like his daddy :). Right now his favorite pajamas are the 'Brasil' shirt Steve brought back from a work trip, and some blue striped gym shorts -- because his daddy has the same outfit that he sleeps in. 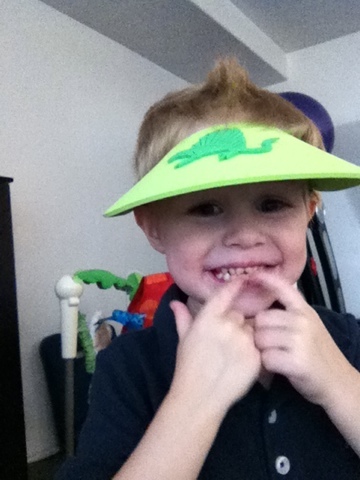 - He loves playing "Armadillo-Fish-Camel" with his daddy every night before bed. Don't even ask me what it is. I've watched them do it every night, but I still don't know what's going on. But they sure do! - Gray calls M&Ms "em-anemones". He says rhinoceros "rhino-oceros". He says syrup "syrrie-lup". - He is pretty much potty-trained! Just a few accidents every once in a while. - He is LOVING preschool! He made the visor in this picture at preschool, and is very proud of it.